One of the things that fascinates me more than anything is the difference in how people view themselves versus how other people view them. The Dove Real Beauty sketches captivated me because they showed tangible examples of how most of us see ourselves in much more of a negative light than others do. 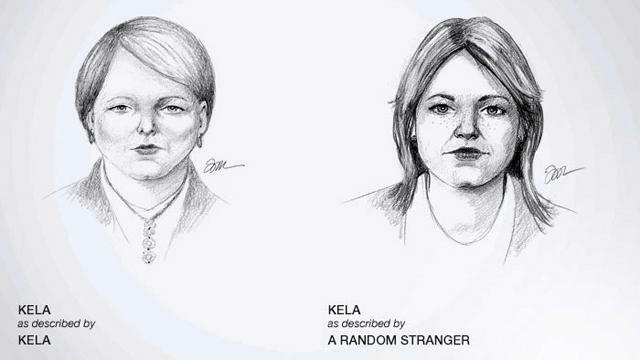 In case you can’t click the link or haven’t seen the sketches, the idea behind them is a former FBI sketch artist asked women (that he couldn’t see) to describe different features of their face. He asked about their chins, their cheeks, their hair. Then, after sketching their description, he would ask someone else to describe the first person. At the end of the video, he showed the original person both sketches. The reactions were all the same. The women didn’t recognize the person they described. They thought the sketch described by the random person was prettier and more positive. They were brought to tears over the difference. At the end of the video, as it was fading out, a screen came up that said, “You are more beautiful than you think.” I love that. I love that a company created an entire campaign telling women they are more beautiful than they think. That’s so incredibly true and it’s something all women should hear more often than they actually do. After reading that phrase, I started thinking. What words could I change in that sentence and have it still be true? You are more important than you think. You are more cherished than you think. All of these adjectives kept popping in my head. I could list out hundreds more and they’d all be just as true as the others. Over the past few weeks since first seeing the advertisement, one adjective has stuck out more than others: creative. You are more creative than you think. This past weekend we debuted a new set design at church. My team killed it and I was very proud of it and them. I got text messages all weekend from friends telling me they loved the design. One of the things I heard over and over was some form of the phrase, “You’re so creative. I wish I had half of the creative mind you do.” The crazy thing about that statement is I think the same exact thing about most of the people around me. I’m not as good as him. I never would’ve thought to design that graphic that way. I’m not as good as her. I never would’ve thought to put those colors together. I’m not as good as that church. I never would’ve thought to tie that together in that way. Those are the thoughts that go through my head. You may read that and not believe it because my title is “Creative Director” or because you’ve seen a graphic I’ve made or a set I’ve designed. The truth is you are just as creative as I am, if not more. What people see from me is the final product. They don’t see the rough drafts. They don’t see the concepts I can’t even pull off. They don’t see the ideas that get halfway developed before I realize they’re stupid and throw them away. What they see is the polished, finished, as pretty as it’s going to get version. Creativity isn’t in the finished product. On a given week, I throw out hundreds of ideas. What about this? Have you thought about that? Could you do it this way? Over and over and over I’m looking to see if there’s another way. Is what we’re doing the best way possible? Do you want to know what I hear more than anything? Out of hundreds of ideas, I’m lucky if one or two even make it past the original thought. From there, it’s a long process to go from idea to finished product. Turning an abstract idea into something concrete takes time and energy and emotions and all sorts of other things. None of those, in my mind, are what makes you creative. The idea is what is creative. The one thing I believe keeps most people from being creative is being afraid to fail. They’re afraid to be told no. They think their ideas are their identity when in reality, they’re just their ideas. Every Tuesday afternoon at 3:30 I sit in a room with my senior pastor, our discipleship pastor, our teaching pastor, and our worship pastor. I’m the only non-pastor in the room. Each Tuesday, whoever is teaching that weekend will present to us the rough draft of his talk. After presenting it, he asks for thoughts and feedback. Each week, I throw out ideas. What if you flipped the order of this and that? Do you have a story that you could tell here to illustrate that differently? Could we close with this song instead of what you have planned? I’m not invited to that meeting each week because I have a brilliant theological mind or because I’m a great communicator. I’m invited to it to give ideas. Most of my ideas are immediately shot down. Some of them are laughed at but lead to other ideas. Occasionally one of them is used. The key is each week I continue to throw out my thoughts and ideas. Regardless of how many times I’m told no, picked on, or laughed at, I continue to toss out things I think could improve the sermon. What’s the one thing you think is a good idea that could improve something you do? What would you suggest if you knew you wouldn’t be laughed at? What’s holding you back from sharing them? This is a safe place. Leave a comment with an idea that you have. Let’s start a conversation. Your idea could lead to another idea that is then tweaked or changed into an even better idea. This was originally posted in June of 2013. On Fridays, I will be reposting old topics from years ago. I hope you enjoy them as much now as I did writing them then.